A bombastic musical comedy, The Blues Brothers is a raucous exercise in unconstrained charisma. The story of two hip brothers seeking to raise money for an orphanage is just a good excuse for automotive mayhem and buoyant musical performances. Released from jail after serving three years for robbery, Jake Blues (John Belushi) is picked up by his brother Elwood (Dan Aykroyd) driving a repurposed ex-police car. Together they visit an orphanage run by nuns, and discover that the institute will shut down unless a $5,000 tax bill owed to the City of Chicago is settled within days. Jake and Elwood decide that they are "on a mission from God" and set out to do the only thing they know how: reunite their old blues band and perform a show to raise the required money. They track down their old bandmates, who are all initially skeptical but ultimately game. Along the way, Jake and Elwood manage to enrage the police and the local neo-Nazi chapter, while a mystery woman (Carrie Fisher) does all she can to blow the brothers to smithereens. Hotly chased by their pursuers, the reunited Blues Brothers bungle their way into a show at a rough country and western eatery before finally landing a gig at a lavish hotel to give themselves a chance at raising the funds in time. 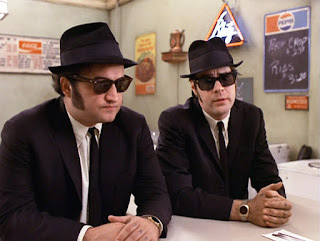 The Blues Brothers is a celebration of excess. 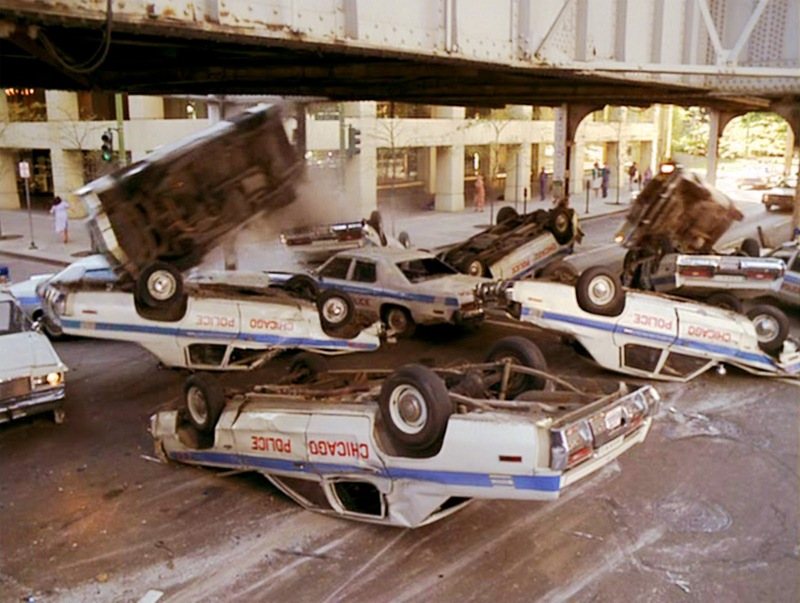 Perfectly mixing music and comedy, director John Landis packs in over-the-top auto chases filled with wild stunts and crashes involving a ridiculously large number of cars, along with several long, energetic music numbers. He also milks every drop of star John Belushi's stratospheric star power, and unapologetically delivers an over-budget 133 minute musical comedy about very little. It is all disproportionately larger than life, and it all works. 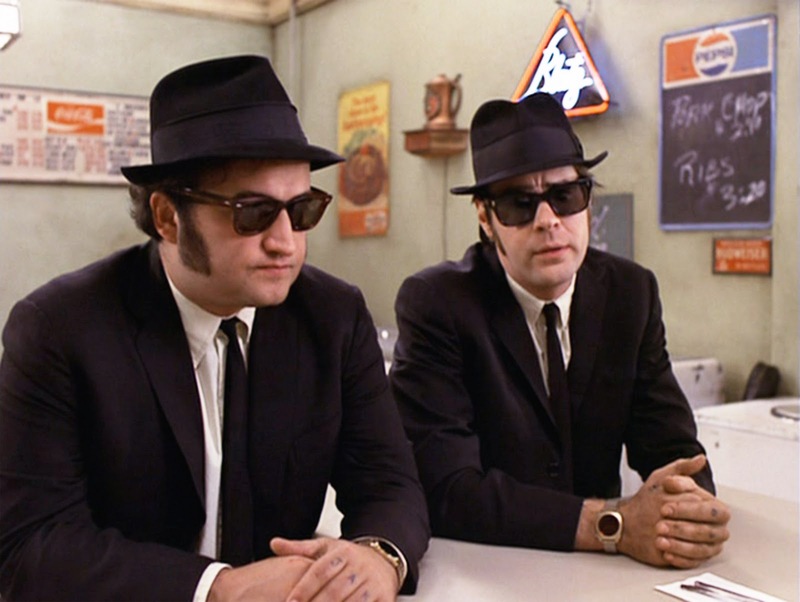 Inspired by Saturday Night Live sketches and capitalizing on Belushi's post-Animal House popularity, The Blues Brothers is more an attitude and a cultural landmark than a narrative-driven film. Co-written by Landis and Aykroyd, the film achieves a cool vibe, with the two lead protagonists quickly achieving cult likability by sticking to their principles and their dark suits, hats, and shades, achieving hyper self-awareness and simultaneously remaining oblivious to the carnage unfolding all around them. The highlights are many. The performance at Bob's Country Bunker is the perfect irreverent set-up, a place where the blues band has to quickly pretend to love country music, and where chicken wire protects the band from beer bottles hurled at them to signify derision and appreciation. Carrie Fisher's mystery woman bursts into the movie at regular intervals with ever more destructive weaponry, harbouring all of hell's fury. James Brown, Ray Charles and Aretha Franklin among others show up for extended and dynamic musical cameos, sparking career revivals. And Landis somehow makes it perfectly logical that by the end of the film, an army of law enforcement vehicles, a militant group of neo-Nazis, and the Good Ol' Boys country band and their RV are all in hot pursuit of the Blues Brothers. Aykroyd and Belushi are as smooth as any film buddy couple can be, whether acing their cool test, escaping from hundreds of police cars or performing their unique music-and-dance routines. In addition to Fisher and John Candy, the supporting cast is peppered with blues performers thought to be well past their prime, until the film propelled them back into the limelight. The Blues Brothers is a spectacular success, but with a dark cloud hovering on the horizon. 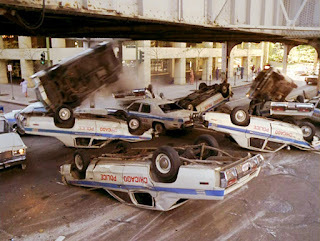 Within two years of the film's release date, Belushi was dead from a drug overdose, and Landis was charged with manslaughter for the tragic deaths of Vic Morrow and two child actors on the set of The Twilight Zone, caused by pyrotechnics bringing down a helicopter. Every type of excess, as it turns out, has its limits.